Summary: Olive oil, along with red wine and berries, contains polyphenols, which have been shown to suppress inflammation, angiogenesis and tumor growth. In a new study, researchers describe how one type of polyphenol found in olive oil inhibits angiogenesis in a mouse model of colorectal cancer. Mice fed a daily diet of the polyphenol DPE had a significant reduction in tumor growth and angiogenesis compared with control mice. The antiangiogenic effects were attributed to suppression of a key angiogenesis-stimulating pathway in cancer. The results suggest that polyphenols in olive oil, red wine, berries and other foods could be combined with cancer drugs or taken separately as chemoprevention. Consumption of olive oil has long been associated with health benefits such as lower cholesterol and a reduced risk of cardiovascular disease. There have also been suggestions that people with diets rich in olive oil may have a lower risk of some cancers due to the anti-inflammatory properties of polyphenols contained in olive oil. A polyphenol of olive oil, 2-(3, 4-dihydroxyphenil) ethanol (DPE), which possesses both anti-inflammatory and anti-clotting activities, has been shown to reduce the tumor necrosis factor alpha–induced activation of the inflammatory pathway in an animal model of colon cancer. Angiogenesis, the growth of new tumor blood vessels, also plays a critical role in the development, progression and metastasis of cancer. Inflammation and hypoxia, the lack of oxygen in tissues such as tumors, are closely linked to angiogenesis in cancer development. Inflammation and hypoxia stimulate angiogenesis through the upregulation of a number of cell signaling factors, including hypoxia-inducible factor-1 alpha (HIF-1a), cyclooxygenase-2 (COX-2), and prostaglandin E2 (PGE-2). PGE-2 has been shown to promote both tumor growth and angiogenesis. 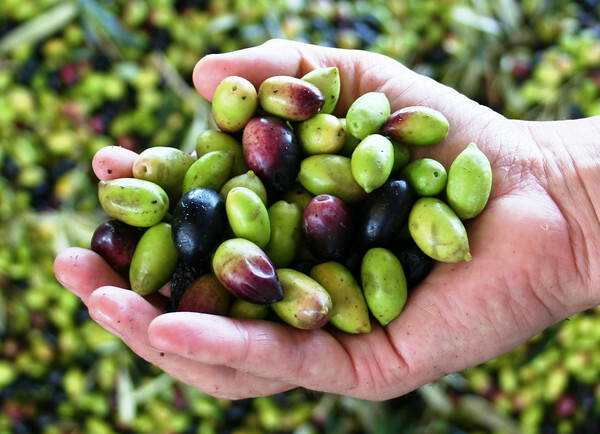 Given the established anti-inflammatory properties of olive oil, researchers in Italy, Spain, and at the U.S. National Cancer Institute sought to find out whether the olive oil polyphenol DPE could inhibit angiogenesis in mice with implanted human colorectal cancers. The scientists also used several assays to evaluate the specific anti-tumor and antiangiogenic activities of DPE. As expected, DPE inhibited the production and activity of PGE-2, HIF-1 alpha, and vascular endothelial growth factor, the primary angiogenesis-stimulating protein, and inhibited the growth of colorectal cancer cells in vitro. Mice that were fed DPE (10 mg/kg/day for 14 days) had reduced tumor growth, likely due to the antiangiogenic effects of DPE. Inflammation, angiogenesis and cancer development are closely linked processes with a complex interplay of signaling pathways. This study indicates that compounds with anti-inflammatory and antiangiogenic properties, such as DPE, resveratrol and other polyphenols, might be combined with chemotherapy drugs or used separately as chemoprevention.